It looks like those around the NBA are finally beginning to give Miami Heat head coach Erik Spoelstra the recognition he deserves. On Thursday’s edition of “The Woj Pod,” which featured host Adrian Wojnarowski and guest Zach Lowe, the two discussed the emergence of Spoelstra and how he’s been underappreciated through his years. Sine his induction as head coach of the Heat, Spoelstra has had some tall tasks assigned to him. First, he was asked to manage the collective egos of LeBron James, Dwyane Wade, and Chris Bosh. Then, he was asked to uplift a gutted team after James’ departure in 2014. 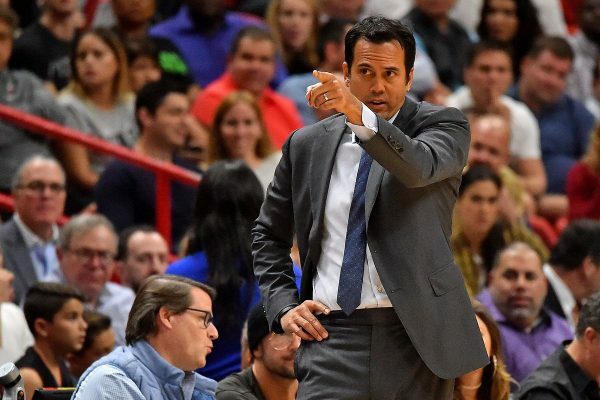 Spoelstra not only managed to keep the team in order, but he also brought home back-to-back championships for the city of Miami and continues to spearhead competitive Heat teams year in and year out. True Heat fans know the value that Spoelstra has had within the organization for years now. Team president Pat Riley has fully entrusted Spoelstra to lead the team and will continue to do so into the distant future.